Voter suppression is a strategy to influence the outcome of an election by discouraging or preventing people from voting. It is distinguished from political campaigning in that campaigning attempts to change likely voting behavior by changing the opinions of potential voters through persuasion and organization. Voter suppression, instead, attempts to reduce the number of voters who might vote against a candidate or proposition. The tactics of voter suppression range from minor changes to make voting less convenient, to physically intimidating prospective voters, which is illegal. Voter suppression can be effective if a significant amount of voters are intimidated or disenfranchised. Because elections are locally administered in the United States, voter suppression varies among jurisdictions. At the founding of the country, most states limited the right to vote to property-owning white males. Over time, the right to vote was formally granted to racial minorities, women, and youth. During the later 19th and early 20th centuries, Southern states passed Jim Crow laws to suppress poor and racial minority voters – such laws included poll taxes, literacy tests, and grandfather clauses. Most of these voter suppression tactics were made illegal after the enactment of the Voting Rights Act of 1965. ↑ Powers, Scott; David Damron (January 29, 2013). 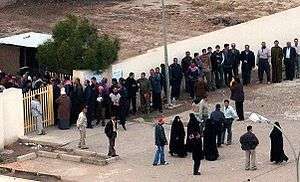 "Analysis: 201,000 in Florida didn't vote because of long lines". Orlando Sentinel. Orlando, Florida. Retrieved 2016-02-26. ↑ Orr, Graeme "Court by surprise: the High Court upholds voting rights", 6 August 2010. ↑ "Robocalls complaints came 3 days before 2011 election". CBC News. 2012-11-19. Retrieved 2012-11-19. 1 2 3 4 MacCharles, Tonda (May 23, 2013). "Robocalls: Widespread but 'thinly scattered' vote suppression didn't affect election, judge rules". Toronto Star. Retrieved 2013-05-27. ↑ "Tower Hamlets election fraud mayor Lutfur Rahman removed from office". BBC News. 23 April 2015. Retrieved 23 April 2015. American Center For Voting Rights, August 2, 2005, report.